Reasons for spending your holidays in Jelsa; 1. Beautiful beaches; first one is only 150 distant from our apartment. The beaches at Jelsa are highly rated and considered very family-friendly. 2. Boat Trips; Many boats depart come and go from the natural harbour at Jelsa (only 150 m from our house), offering trips around the scenic coastline and passing through a host of secluded inlets and hidden bays and coves. 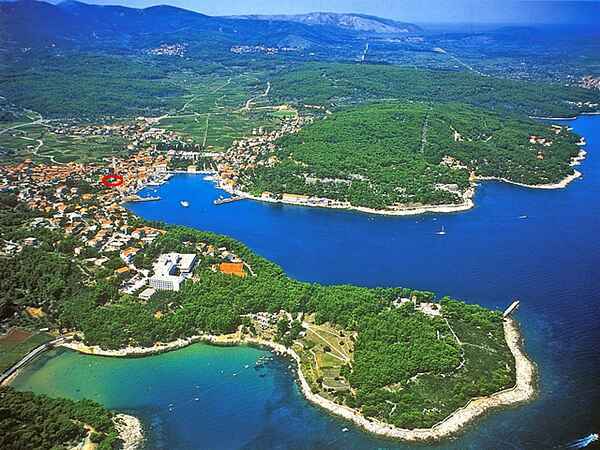 Popular destinations by boat are the neighbouring islands of Brac and Zecevo, and Split, to the north. 3. Scuba Diving; the rocky coastline makes for great scuba-diving conditions, with the local dive school in Jelsa heading out along the craggy headland to sites featuring caves, canyons and grottos, and offering special courses including night-diving. 4. Water Sports; Those looking for something more than just relaxing on the beach can try their hand at sailing, renting a speedboat, kayaking, surfing, fishing and deep-sea fishing. 5. Sports; Guests wanting to stay in shape on their holiday in Croatia can visit the sports centre, work out in the gym, play beach volleyball, basketball and football, or indulge in family activities such as mini-golf, table-tennis and boccia. 6. Walking and Biking; Jelsa boasts numerous paths for walking and biking enthusiasts to discover. 7. History; History buffs have plenty to discover in Jelsa, with the town home to Gothic and Baroque churches, as well as remnants of the fortress walls and nearby Greek ruins. 8. Entertainment and Events; As well as relaxing and enjoying the area's delicious Croatian food and drink in the local bars and restaurants. Jelsa also offers rich nightlife in disco and bars. " Jelsa is an ideal place to stay if you want to discover the whole island Hvar, it’s located in the center of the island wich makes it perfect for planning trips around the whole island and seeing all it’s beauty.